Chrome is releasing a series of Knurled Welded Waterproof Rolltop bags this Spring (2014), perfect for bike camping, adventure biking and commuting in all types of weather. Rolltop bags are perfect for keeping the wet out, and for allowing you to compact (or expand) the bag volume to fit the contents. The Knurled Welded Rolltop series bags are designed to be as light as possible with maximum weather protection and durability, using their proprietary welding technology that combines RF welding with a mechanical interlock. Hypalon® Molle loops let you carry additional items outside the bags, and a five-bar webbing haul strap provides hand carrying ability when not mounted on the bike. If you're not convinced that these are bombproof, Chrome has a lifetime guarantee. 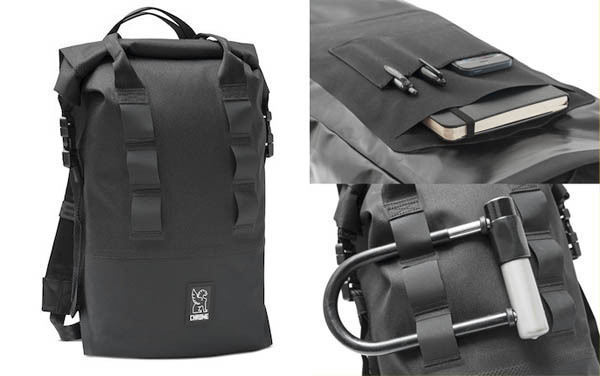 Compact, small capacity 18-liter Welded-Waterproof daypack with an integrated iPad® sleeve is built for urban exploration, self-supported adventure biking, and all-weather commuting. Made to be carried as a backpack or as a tote with the 5-bar webbing handles. Perfect for a day in the woods or winter storms, the Urban Ex Rolltop is 100% waterproof and light enough to go unnoticed. Includes five-bar haul handles, Hypalon® MOLLE system, and sternum strap with mini-buckle. 20-liter Welded-Waterproof Pannier works on and off the bike. The pannier bag itself is hardware free. Each bag comes with a Knurled Welded™ rack adapter that affixes to most racks. This keeps the hardware on the bike not the pannier bag. 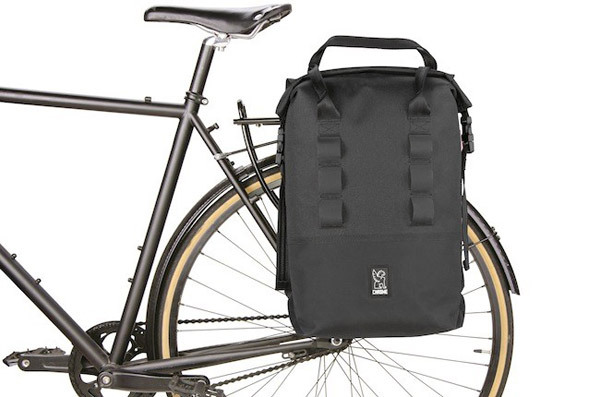 Off the bike, the Saddle Bag Rolltop Pannier is built to be carried comfortably on the shoulder with included shoulder strap or as a tote using the 5-bar haul handles. Made for adventure biking and all-weather commuting, the lightweight Saddle Bag Rolltop Pannier is 100% waterproof. Includes integrated laptop sleeve, five-bar haul handles, and Hypalon® MOLLE system. • Tested and approved for loads up to 25 kilos (55 lbs). 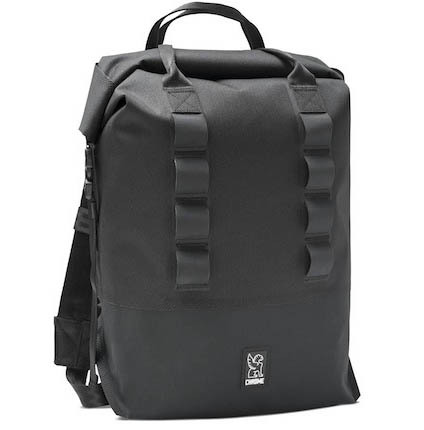 Large 37-liter lightweight Welded-Waterproof pack with integrated laptop sleeve is made for adventure travel, all-weather commuting, and hauling gear. Carry everything you need for an overnight camping trip or simply to get your groceries home dry. 100% waterproof lightweight construction and multimodal carry lets the Excursion Rolltop function in a variety of roles and environments. Includes ergonomic back panel, five-bar haul handles, Hypalon® MOLLE system, and sternum mini-buckle. Dimensions: 13” wide, 26” high, 7” deep"
Welded-Waterproof 40-liter front rack duffle for bike camping, adventure biking, and all-weather commuting. 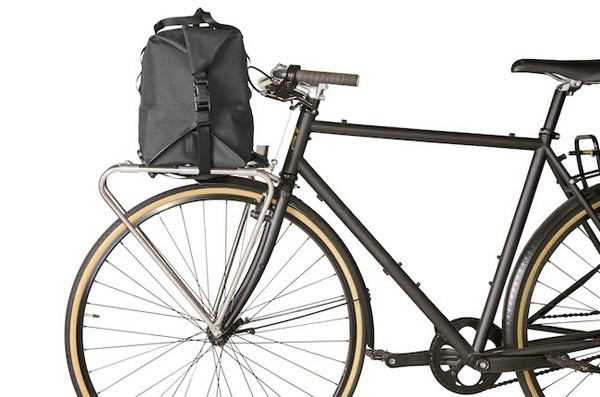 The Front Rack Duffle functions primarily as an off-body bag that mounts on flat Porteur-style racks. The lightweight large capacity Front Rack Duffle was built for long days in the saddle, or short trips across the city. The Front Rack Duffle attaches quickly and the five-bar handles make the bag work well as a duffle. Off the bike, the Front Rack Duffle’s mounting straps can carry a blanket, sleeping bag or other large cargo on the exterior. 100% waterproof and lightweight, the Front Rack Duffle is our solution for a large volume, low impact bag that mounts on the bike and isn’t a backpack. • Quick release bottom and side straps for securing to a front rack.